I am just gonna come out and say it… ya know those cutesie little stick people families you see on the back of minivans these days? But, I struggle with this for many reasons. 1. I am a tad embarrassed. Like maybe those little stick people families are too cutesie and my friends will laugh and roll their eyes when they see me pull into the parking lot. 2. I don’t think I deserve one. 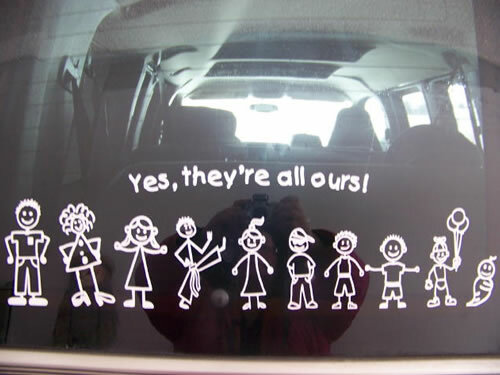 Those cute lil stick people families seem like they belong on the back of a minivan that is clean and organized. It seems like moms of stick families drive vans free of trash and toys littering the floor. They’re the moms who arrive to practice on time, with water bottles and a nice big blanket for the family to sit on and watch practice. Doesn’t seem like they belong to the moms who show up with children wearing mixed matches shoes, who forgot their water bottles and who bring their light sabers to battle while they wait for their sibling to practice. 3. Lastly, let’s just say I got over my stick people issues, how in the world do I choose? I’ve spent a fair amount of time this week browsing the good ol’ world wide web looking for stick people to represent the circus fam. And let me tell you, it ain’t easy. How in the world do you find one person to adequately caricaturize your family member? Honestly, mine and baby number 4 are the easiest… there are a plethora of “mom juggling” stick people to pretty much sum up myself. And thankfully with the one year old, I pretty much have to choose between baby holding bottle, baby with pacifier and baby crawling or walking. But how do I pick Scott’s? Do I go with working man? Doesn’t that seem like maybe he is a work-a-holic? He likes to barbeque, but does that really sum up his whole persona? Not really…And while he does enjoy drinking a beer every now and again, I highly doubt that is the symbol he wants gracing the back of the van. If only they had a guy on a sailboat… I have searched and searched for this to no avail. If he did karate, I could find that, but sailing, no such luck. And what about the kids? My son likes baseball, is a cub scout, enjoys playing army and legos and Star Wars… how does one pick one activity, one symbol to describe him? And the girls?? They both love soccer and gymnastics… can I find a gymnast kicking a soccer ball? No…. What are your thoughts on the stick people gracing the backs of minivans in front of you on the road? Do you have one? How did you pick? What do you think I should pick for us? Or do you think I should leave well enough alone and not bother with the stick people on the back of the circus mobile? As I put together my post yesterday, I greatly enjoyed looking back at pictures of the kids at the strawberry patch over the years. I was struck by so many similarities and differences. Sisters working side by side…. Here’s to many more fun memories! When my son was 3, I took him strawberry picking for the first time. It was a special Mommy/Son date prior to the birth of our third child. The next year, we returned, but this time it was a family affair. 2009 brought us back to the same farm, this time with friends. And 2010 found me once again at the fields pregnant, with many small children in tow. This year we found ourselves returning to the farm for a somewhat spontaneous trip. I knew I wanted to go this spring. (it has, after all, become a tradition). But with rain forecasted and a busy week planned, I wasn’t sure when. We woke to cloudy skies, but no rain and so I hurried the circus crew out the door before they even finished breakfast! We were home with our pickings before 10 am!!! What about you? What are some of your family traditions? This weekend the family went on a Cub Scout camp out from Friday- Saturday evening. The kids have been begging to go camping again, and this over nighter was the perfect little get away for us. As an added convenience it was at a State Park not far from our house, so it was quite easy to pop home if you needed something and made it no big deal when we got a late start on Friday night. The first thing we did on Saturday morning was take the kids fishing… the girls have been eager to try out the rods their big brother game them for Christmas. While we didn’t catch anything and we really didn’t stay at it all that long, we did have a good time breaking out the rods for the first time this season. The boy scouts set up skill stations for the cub scouts to rotate through. I was really impressed with the leadership and maturity of the boy scouts. We also got to take a nature hike with the park ranger. I was truly grateful that they let the whole family participate…an aspect of the cub scouts that I have been most grateful for this past year. This lil man took two a nice long nap in my arms during the nature walk. I have really enjoyed being a part of the Scouts program this year and am excited about the friendships we have developed through out participation this year. It really is a great organization.